Young German Giuseppe Pantaleo started day 4 of the PokerStars European Poker Tour Barcelona in the lead, and ended it the same way. He had to make it through 16 players, and did so with ease, as did 2010 World Series of Poker bracelet winner Konstantin Puchkov who is sitting second in chips on the leader board. Interestingly, for Skotadis, this is his first ever major live event. However, he must be in flying form as he won the Sunday Million recently for $195,000. He takes to the final table in a few hours alongside the honest Lizano, who earlier on day 4 pointed out a counting error that occurred during the transfer of chips between the feature and outer tables, giving him 400,000 more than he had previously counted. He ensured, with the help of Thomas Kremser, that the chips found their original owner, who turned out to be de Vries. Apart from this, day 4 played out without a hitch. Casualties hit the rail frequently and the final eight players were found quickly. Two of the most familiar names remaining going into the day were actually the first to go. 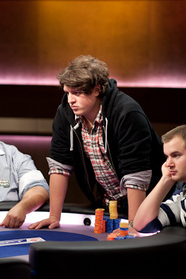 Kristoffer Thorsson was the first to hit the rail after Luis Rufas called his three-bet all-in. Thorsson flipped over A Q and Rufas showed K K . The board was dealt 9 6 4 2 10 and the PokerStars qualifier left in 24th place for €20,000. Another PokerStars qualifier, Dominik Nitsche was next. He finished in 23rd place for €20,000 also. Eight players now await their fates as the final day of play dawns. Check in on the action at the PokerStars blog feed when play gets underway at 12 p.m. (local time), or visit the live final table on EPT Live. Card Player will be bringing you a final recap of all the action tomorrow when a champion has been confirmed.